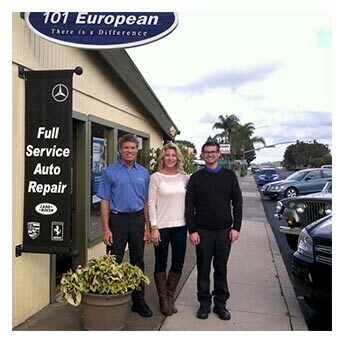 If you're looking for an honest and dependable Solana Beach auto repair shop, place your trust in 101 European. We're Solana Beach's premier auto repair and service shop. Established in 2008, we have been providing our friends and neighbors in Solana Beach and surrounding communities with trustworthy, top-notch auto repair and maintenance services for European and Asian vehicles. Owned by expert technicians Philip Loose and his son Adam Loose, 101 European understands the importance of keeping customers' cars well-maintained. Taking the time to ensure your vehicle is consistently running at its best can help to avoid costly repairs later. 101 European is staffed by experienced and ASE-Certified auto technicians who perform a wide variety of the most commonly requested auto maintenance and auto repair services, specializing in European and Asian vehicles. They receive ongoing training in automotive technology and auto repair services in order to stay up-to-date on the latest innovations. Our auto mechanics use the most current diagnostic equipment available as well as original factory equipment. While dropping off your vehicle so that our experienced technicians can work on repairs or maintenance, we invite you to partake in the various amenities our shop provides. We offer complimentary coffee, soda, treats, snacks, and free Wi-Fi. Need a lift? 101 European also provides shuttle service within a 5-mile radius. In addition, we also have discounted rental cars through a partner just down the street from our shop for customers whose vehicles may need to stay in our shop a bit longer. So, whether you need something as simple as an oil change, or a more complex auto repair, 101 European can take care of your car care needs with honest service that exceeds your expectations. Give us a call today! 101 European Automotive is pleased to offer a wide variety of the most commonly requested auto maintenance and auto repair services, specializing in European and Classic autos. GET YOU BACK ON THE ROAD FASTER! Once again these guys don't push stuff you don't need. I came in thinking i needed a new front end, but they tested and sent me away needing nothing. Literally, 101, doesn't upsell. I have taken my 911 here for years and they have taken care of my rig like a champ. 5 star review by Noa R.
Good start with these folks working on my old British Ford. Very knowledgeable team with loads of collective experience. Patient in helping me understand my new project. With loads of cool cars in and of there, they clearly have a dedicated customer base. That they also have excellent taste in cars for sale, what's not to like? And right there in Solana Beach? Bonus. 5 star review by Tom R.